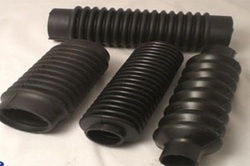 Our range of products include rubber bellow, silicon rubber moulded bellow, silicone bellow, pvc duct hose / copper hose and bi-color silicone tube. We manufacture Silicon Rubber Moulded Bellow that are manufactured from different types of polymers. They are normally used as covers on parts which are critical and need protection from dust. While manufacturing, we keep strict eye on the overall quality and efficient performance of the presented product which is available in customized options and variegated specification to meet the growing competition. Being the most established organization deeply committed to offer a wide variety of Silicone Bellow. This is used by extension for a flexible bag whose volume can be changed by compression or expansion, but not used to deliver air. Easy to install, reliable and long lasting, these offered bellows could be availed form us in a range of sizes and dimensional stipulations to select from. In addition to this, our bellows are provided by us in numerous sizes & customized options as per the needs of customers. Looking for Moulded Bellow ?